May 2017’s custom challenge coin of the month is an intricately-crafted piece celebrating Task Force Buffalo, comprised of soldiers from the 317th Engineer Battalion, 3rd Brigade Combat Team, 10th Mountain Division (Light Infantry) from Fort Polk, Louisiana. As part of the Resolute Support Mission, Taskforce Buffalo works with other NATO-member nations to train and equip Afghan Security Forces. This heavy brass coin is filled with remarkably legible full-color detail! On the “Task Force Buffalo” face, we see the outer edge rendered in deep red epoxy, the Task Force Buffalo, stars, and the flags of Georgia, the United States, Afghanistan, and the Czech Republic filling out the field. The outer rim of the edge features intricate gold rope detailing. The central part of the coin contains a silhouette of the Nation of Afghanistan styled after the Afghanistan flag, the shoulder insignia of the 10th Mountain Division, the seals of the Marines, the Army, and the Navy, and the 317th Engineer Battalion. All are cast in incredibly fine detail. Even the very small devices on the seals are clearly visible. The counter face is encircled by a red decorated edge similar to the first face, in this case containing the phrases “317th Engineer Battalion” and “Operation Resolute Support 2015-2016.” Like the other face, the outer rim of this edge also features gold rope detailing. The central face is dominated by the U.S. Army Corps of Engineers Battalion branch insignia, complemented by the rank badges of a Lieutenant Colonel and a Command Sergeant Major on the left and right sides, respectively. This face also contains the dedication “Presented for Excellence” along with the unit name and motto. As with the rest of the coin, this face is rendered in hard-wearing and beautiful color epoxy. The Resolute Support Mission is a NATO-led joint operation responsible for training and equipping Afghan Security forces. Though many of the images we associate with the Global War on terror portray the mission in Afghanistan as an on-the-ground war against the Taliban and associated forces, the fact is much of the mission for more than a decade has focused on training and equipping native freedom fighters battling terrorists on their own soil. The United States has a long-standing relationship with Afghanistan, going back to World War two and reaching a nadir during the Cold War. Then, as now, the Western world faced an existential threat from a difficult and intractable enemy against whom conventional military tactics were simply infeasible. And then, as now, we trained up valiant and scrappy domestic forces to deal with a mutual enemy. Though all explicitly military forces were recalled from the Afghanistan theater in 2013, several units like Task Force Buffalo have continued to operate in the area. The intelligence agencies of the United States continue to exercise a great deal of influence in the region, operating a small army of contacts and double agents working to undermine and subvert the Taliban. Even though an official “end” was called to the conflict, our men and women in uniform continue to put themselves in harm’s every day, albeit in slightly different contexts. Taskforce Buffalo oversaw the security of Baghram Air Base. Baghram Air Base, also known as Baghram Airfield, is the largest U.S. military base in Afghanistan. Troops from the 10th Mountain Division have occupied the Airbase since it was taken by a British Special Boat Service operation in 2001. In June 2016, Taskforce Tiger turned over their operations to Taskforce Tiger, comprised of soldiers from the 1st Squadron, 3rd Calvary Regiment, 1st Calvary Division out of Fort Hood, Texas. Taskforce Buffalo was well-regarded for their valorous conduct defending Resolute Support Mission assets in Parwan Province. Units like Task Force Buffalo and Task Force Tiger remain in the fight to help bring peace and stability to a region which has been wracked by war and strife for decades. Sometimes we can forget about what goes on behind the scenes to insure our freedom. In fact, some people behind the scenes would rather it be that way. War in the twenty-first century is changing. More and more often, units like Task Force Buffalo are called upon to reimagine the battlefield not in terms of soldiers and materiel but in terms of hearts and minds. We all know it is bound to be a long struggle in this war-weary part of the world, but we also know we can count on the men and women of the United States Armed Forces to safeguard our freedom and way of life. Along the way, we are glad to know they are giving others a hand up. We do not just aim to go into other countries, fight wars, and leave a big mess in our wake. The only war you win is the one where the victory is worth the price. That’s why our combined task forces work hard to marshal all our resources to rebuild countries like Afganistan. Along the way, long-standing bonds of friendship between the United States and its NATO allies are rebuilt and solidified, and new friendships are formed between visionary indigenous leaders. Some might think the long-term battle for stability in Afghanistan is too expensive or too speculative. Units like Task Force Buffalo put the naysayers to task with their stalwart commitment to mission and their demonstrable efficacy. By bringing out the nascent potential of an indigenous security force, Task Force Buffalo and units like it are working to make Afghanistan safer for years to come. 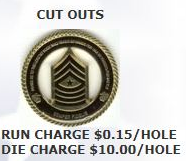 The “Taskforce Buffalo” custom challenge coin is another final example of what is possible in custom-made military unit coins. All our commemorative unit coins are made here in America, constructed from materials built to stand the test of time. We make coins in numerous shapes and sizes, including spinner coins and multi-metal coins. As evidenced by the fine craftsmanship on display in “Taskforce Buffalo” Operation Resolute Support Commemorative Unit Coin, no design is too complex, intricate, or colorful. Call us today for a free Unit Coin quote.